Have I mentioned that I think Bioshock: Infinite is an absolutely gorgeous game? I haven't been able to play it: I don't own a Playstation/good computer; so I've had to settle for watching cut scenes and walkthroughs. The story and characters are brilliant. I really like the character of Elizabeth: she's interesting, plays quite an active role in the game, and her design is great. 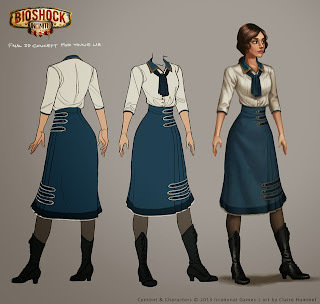 For this year's Malta Comic Con, I'll be cosplaying Elizabeth Comstock on the first day. I wanted to share my process of making the costume. Bear in mind that i did make some mistakes, particularly with the pleats on the skirt. To make a pattern, take your waist measurement, and hip measurement. You also need the length of the skirt, and how much you want it to flare at the hem. 2. Adding in pleats. You need to decide how wide you want each pleat to be e.g. 1 inch. Take a large sheet of paper and fold it into pleats. Stop when you have enough pleats. Cut out the pleats, and attach the pleated paper to one of panels of your skirt pattern. I think the picture above explains it better: the pleats are incorporated instead of one of the panels. 3. Fabric time. I bought calico and dyed it to the right colour. You need two shades of navy, and at least 1.5 metres of each. 4. Cut out you skirt from fabric. You will be using the lighter blue material for the main part of the skirt. The dark blue will be used for the stripe at the bottom, and the 'button strip' decorations. Make sure you have enough light blue material left over for the skirt cuffs and collar, and enough dark blue material for the scarf and hair bow. Make sure you iron your material. If the material is very creased, you might not be able to remove the creases later on. 5. Add the blue stripe on the hem. This is a long rectangle a dark blue material. Iron the raw edges in, pin it down, and sew it along the edge of your skirt panels. Treat it like a giant piece of bias tape. 6. Pleat the skirt. iron the pleats down. You'll probably have to sew the pleats down along their edges, because the pleats don't really stay in place otherwise. The pleats should face towards the front of the skirt, based on stills from the game. 7. Add the little button strips. These are just double head arrow shapes. Face two pieces of cloth right sides together, draw the shape using tailor's chalk, and sew around the outline, leaving a gap so that you can turn it right side out. Sew the gap closed. 8. Next, sew the strips to your skirt. To make sure they stay on, you can use a small zigzag stitch, and go back and forth a few time. Then sew gold buttons to both sides of each button strip. I made mine out of polymer clay and thin wire, but it would have been easier just to buy them. 10. Add a waistband to the skirt. The waistband should be 3 pieces: the front piece is cut on fold, the other 2 are separate (make sure you add seam allowance). Using iron-on interfacing with help to make the waistband sturdier. Add a hook and eye to close the top of the skirt. I dont know if you will see this, but if you do, can you email me at inazoo961@gmail.com please? I need help figuring this costume out.